SLAMLab at APS March March Meeting in Boston, MA – Congratulations to Corbyn, Hunter, and Mauricio for presenting their recent research progress at APS! Dr. Ahmed attended an exciting interdisciplinary workshop on Negative Pressure in Multiphase Environments at the University of Ulm – looking forward to some new negative pressure experiments! Congratulations to Mauricio and Sara for being awarded the Dan Black Family Fellowship! Congratulations to Corbyn for being awarded the Dan Black Family Phys-Bus Fellowship! Congratulations to Hunter for being awarded the Eiker Adams Award! Congratulations to Alex, Hunter, and Sara for being admitted to the Princeton University – Physics of Life Summer School! Congratulations to Mauricio for being admitted to the UCSF Summer Research Training Program! Congratulations to Monika for being admitted to the Univ. of Houston REU on Neurotechnologies! Congratulations to Corbyn for being highlighted in the OC Register! The DynSS (Dynamics of Small-scale Systems) group has been actively growing with their monthly seminars by Dr. Ahmed, Dr. Hargreaves, Dr. Jimenez, and Dr. Brubaker; along with hosting several colloquium speakers: Dr. Jun Allard, Dr. Ryan McGorty, Dr. Mark Ilton, and upcoming Dr. Paul Nerenberg! Dr. Ahmed visits University of San Diego to give the Physics Colloquium. Had lots of fun chatting with faculty and students about their research! 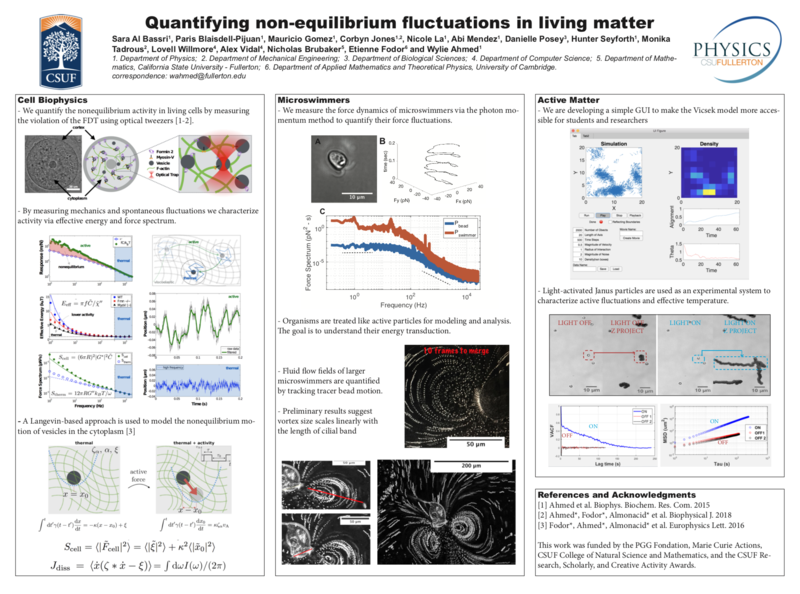 Dr. Ahmed presents on “Quantifying nonequilibrium fluctuations in living matter” at the GRC for Stochastic Physics in Biology in Ventura, California. This conference’s theme was “Fluctuations, Landscapes and Statistical Mechanics of Biological Heterogeneity”. Below is a poster summarizing some of the talk. Congratulations to Monika for winning a poster competition at the APS Far West Section! You are racking up the awards! Dr. Ahmed gave the Physics Colloquium at Harvey Mudd College! Sara highlighted by Daily Titan! 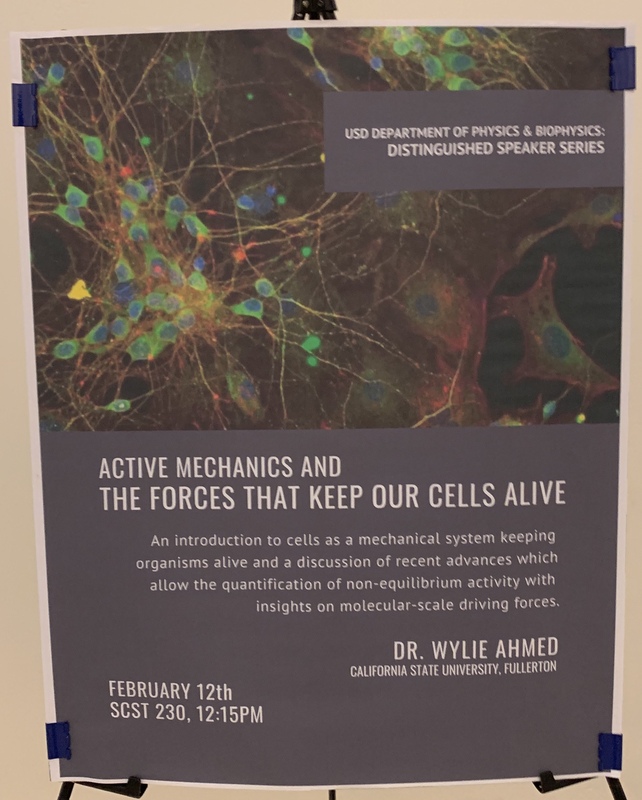 Dr. Ahmed is giving a colloquium on active mechanics in cells at Cal State LA today!